Before I get into the regular subject matter, I want to alert you to a special put-selling event I’m hosting Wednesday at noon. I’m focusing on put-selling because it’s the cornerstone of many of my other options strategies, and arguably the most important part. Why is it the most important? Well, selling a put generates immediate income. I estimate selling just one put could bring in at least $85 a month on average. Even if you do nothing else, that’s $85 a month you wouldn’t have had otherwise. But selling puts can be a part of a bigger trade like a vertical spread or an iron condor – so understanding the fundamentals of selling puts opens up a ton of opportunity. I hope you’ll join me this Wednesday. Click here to attend for free. Last Thursday eBay shares took a tumble. Now, I’m not going to try and guess where the stock is going over the next 30 to 60 days, but I know as a contrarian these are the type of short-term scenarios I seek. 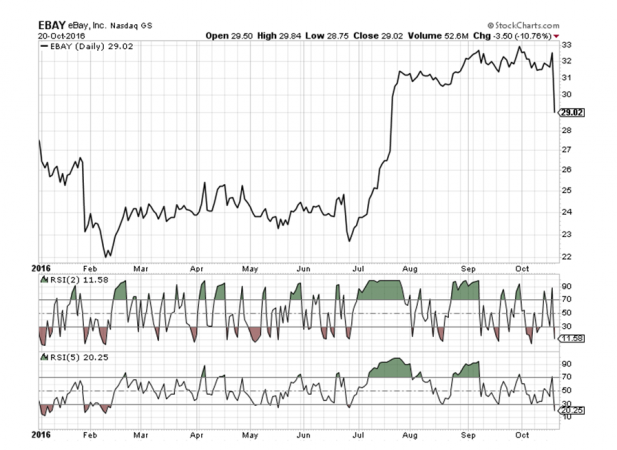 Fear has moved into the stock, which has led implied volatility to double in just a few trading days. Over the next few paragraphs I’m going to show you how to take advantage of the fear and sharp advance in implied volatility by selling puts. If you are a contrarian, or simply want to own EBAY at over an 8% discount to the current price, I’m certain you will find the following discussion insightful. As always, if you have any questions please feel free to email me. Selling a put obligates you to buy shares of a stock or ETF at your chosen short strike if the put option is assigned. For example, let’s say you wanted to buy Ebay (NASDAQ: EBAY) but not at the current price of $29.02. You prefer to pay $24 for the eBay shares. By selling the May December 27 puts you can bring in approximately $0.41 or $41 per contract. In this instance, you are selling the put with the intent of buying the stock for $27 if, at expiration in roughly 57 days, the stock is trading at or below $27. Selling the 27 put requires you to have $2,700 of cash in your trading account. In a margin account, selling puts only require 20% of the $2,700, or $540, but retirement accounts and certain brokers require the puts to be cash-secured. And in this case, that would be the $2,700. The return on the trade is 1.5% cash-secured or 7.6% on margin over roughly 57 days . . . almost 10% annually. 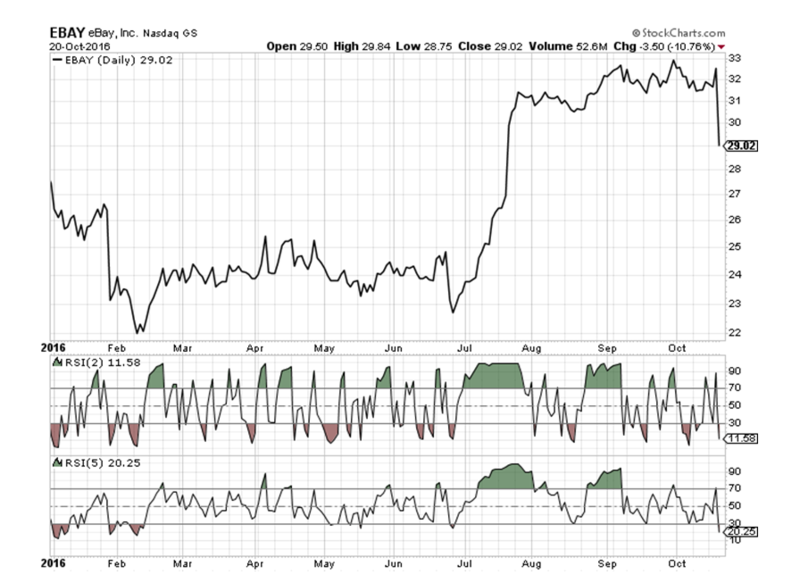 And if the puts were not cash-secured, the return would be significantly higher on an annual basis. As you can see from the options chain below, you have other levels where you can sell puts. If you choose to sell a strike closer to the current price of the stock, say $28, you could bring in even more premium, but the probability of success goes from 73.81% for the 27 puts to 62.06% for the $28 puts. So, you do have to make a few decisions as to how much risk you are willing to take based on the strike you choose. Let’s say we decided to sell the December 27 puts for $0.41. The $41 is ours to keep regardless of what occurs with EBAY. If the stock closes at December expiration above $27, we keep the $41 and oftentimes repeat the process by selling more puts, maybe at the 27 strike or possibly at a different strike price. It truly depends on where the stock is trading at the time we sell the puts and how much premium we wish to bring in. If eBay shares trade for less than $27 at December expiration, we are assigned the stock for $2,700, 100 eBay shares per put contract sold. But my actual cost basis, or break-even point, is now $26.59, or 8.4% below where it is currently trading and 18.2% below Wednesday’s closing price. Oftentimes when this occurs I will begin to sell covered calls on the stock so there is an ongoing source of income coming in. I take this approach in one of my High Yield Trader portfolios, appropriately named, The Income Cycle.